Features These products are specific agents for inhibiting filamentous bulking and preventing abnormal phenomena in activated sludge. This agent is an environmentally friendly special surfactant that is based on food additives; it solubilizes oil contained in effluent in a short time and promotes biodegradation. This agent removes oil efficiently by reducing the size of oil in the effluent to the micrometer scale, which allows microorganisms to easily take in and degrade the oil. Solves troubles such as buildup of floating scum and sludge. 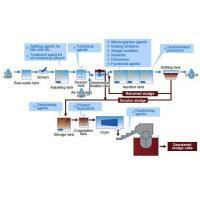 Reduces the cost of treatment and disposal of sludge by reducing the amount of floating scum. Prevents adverse effects such as the formation of oil balls, blockage of pipes, and generation of odors. Promotes savings of labor and time to clean facilities. 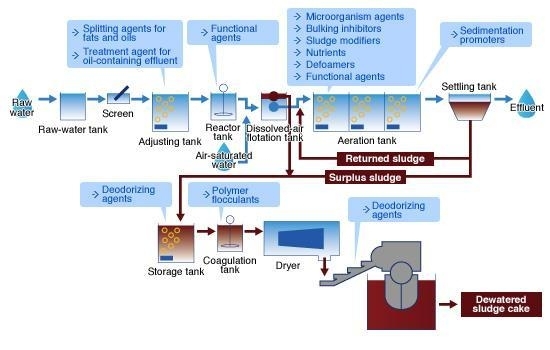 The agent is made of food additives and is applicable to all types of effluent due to its high biodegradability and high safety.